CLEVELAND (AP) Indians manager Terry Francona expected to see Oliver Perez run out of the bullpen. Pitching coach Carl Willis made the call for Dan Otero instead. The mixup was a miserable one for the AL Central leaders. 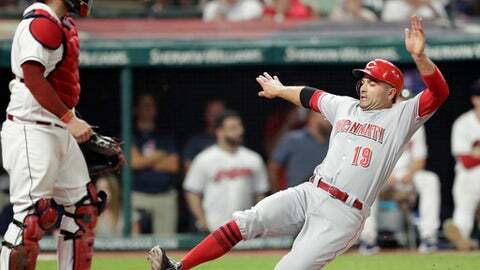 Joey Votto hit a go-ahead, three-run double off Otero in the ninth inning as Cincinnati scored seven times with two outs, overcoming a gem by Trevor Bauer to beat Cleveland 7-4 on Tuesday night. Willis, who rejoined the staff this season, accepted responsibility for the mistake. He noted that Votto was 0 of 4 in his career against Otero, but said he should have asked Francona for clarification. Allen (2-4) initiated the sequence by loading the bases after recording two outs in relief of Bauer, who struck out 12 in eight shutout innings. Cleveland’s bullpen entered the day with the third-highest ERA in baseball at 5.13. Adam Duvall also doubled in a pair in the ninth, while Jose Peraza and Eugenio Suarez had RBI singles off Allen. Cincinnati’s final seven batters reached base before Scooter Gennett ran into the third out on Suarez’s hit. Making his first start since being named to his first All-Star Game, Bauer only allowed three singles and didn’t surrender a hit until Jesse Winker’s one-out liner up the middle in the fifth. The right-hander became the second major leaguer to post seven consecutive quality starts with eight-or-more strikeouts and no homers allowed, according to the Indians. Pedro Martinez holds the record with eight in 2002. Former Cleveland reliever Kyle Crockett (1-0) netted the final two outs in the eighth after righty Sal Romano went the first 7 1/3 innings. Raisel Iglesias worked the ninth for his second save in two nights and his 19th of the season. Francisco Lindor hit his fifth leadoff homer of the year and fellow All-Star Jose Ramirez had a solo shot for the Indians. Ramirez’ home run was his 25th, marking the eighth time in franchise history the milestone has been reached in the first half of the season. Reds interim manager Jim Riggleman earned his 700th career win, but was unaware of it until after the game. Cincinnati is 38-36 since he took over for Bryan Price on April 19. The four-run comeback in the ninth was the Reds’ first since June 30, 2006 against the Indians. Reds: RHP Homer Bailey (right knee) reported no physical issues after throwing two innings out of the bullpen Sunday in a rehab assignment with Triple-A Louisville. Indians: OF Lonnie Chisenhall (left calf) will miss 8-10 weeks after a second medical opinion confirmed a Grade 3 strain. He was placed on the disabled list on July 3. Reds RHP Tyler Mahle (7-6, 3.66 ERA) takes on Indians RHP Carlos Carrasco (9-5, 4.28 ERA) in the three-game series finale. Mahle hasn’t lost since May 20, going 4-0 in eight starts, and has an NL-low 2.04 ERA since June 1.